I ended up arriving back in Hanoi at 3am, which was earlier than expected. Luckily my hostel had already told me that I could crash on their common room floor. Along with two other, we slept for a couple of hours before rising at 6am to see all the shenanigans around Hoan Kiem lake. 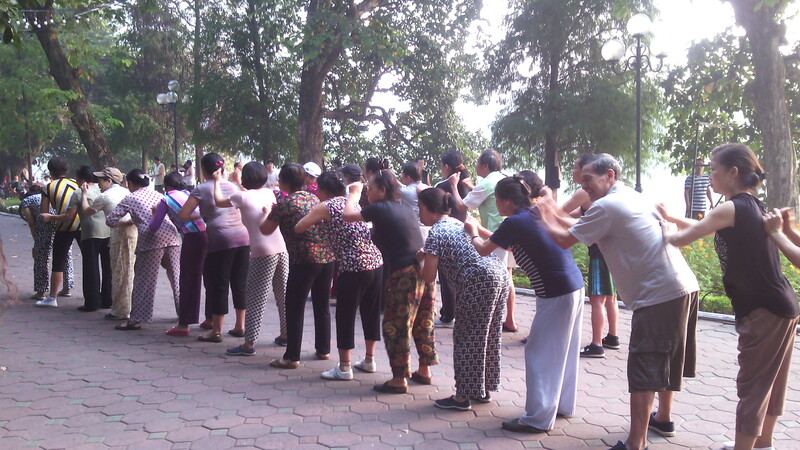 It was so interesting: people doing Tai chi, aerobics, ballroom dancing, badminton, fitness, stretches and even massages. We joined one of the massage lines for a laugh, where even with the language barrier, was welcoming.Once we strolled round the whole of the lake, I checked into the hostel and had breakfast. As I was meeting a friend late morning, I went to visit the Opera house, history museum and prison but didn’t get time to look around. Once I met up with a friend, we visited the Temple of Literature, which was pretty big but wasn’t that informative. Then we saw the One Pillar Pagoda, Ho Chi Minh Mausoleum, palace with the guards, West lake and Tran Quoc Pagoda (which was a disappointment) before enjoying some local street food: plantain/potato and spinach/ greens sauce with fried tofu and rice. We walked back to the Old Quarter to sort out our boat cruise to Halong bay. I had heard some horror stories of people paying a ridiculous amount and ended up on a party boat with poor quality. I decided to pay a little cheaper than I was going to so that I could not be disappointed but it still included all the things I wanted to do. To enjoy 5,000 dong (16p) beer and cheese stick. For the rest of the night, I bar hopped, where free shots where given and ended up dancing the night away at a club. When I got back to my hostel at the early hours of the morning, the shutters were down and after bashing on the gate and ringing the door bell for half an hour, I finally got let in.